The Atlantic blue crab is found in tidal estuaries of the Atlantic Coast and the Gulf of Mexico. 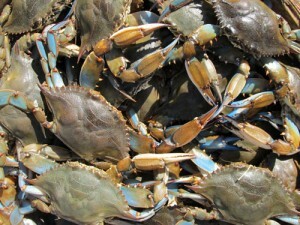 Blue crabs are most abundant in the Delaware Bay, Chesapeake Bay, Albemarle – Pamlico sounds, and inland waterways in the Gulf of Mexico. Top U.S. states for blue crab production include Maryland, Louisiana, Virginia, and North Carolina. Male blue crabs, called Jimmy crabs, have bright-blue claws and legs. Mature females have bright -orange tips on their claws. Males are larger than females, often reaching 7 or 8 inches from shell point to point. Depending on size, blue crabs weigh 5 to 16 oz. each. Colossal – 6 1/2 inches or more. Jumbo – 6 to 6 1/2 inches. Large – 5 1/2 to 6 inches. Medium – 5 to 5 1/2 inches. Small – 4 1/2 to 5 inches. * measured from shell tip to tip. 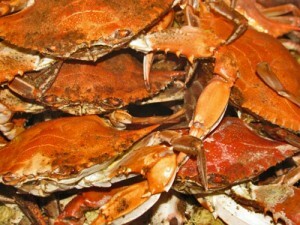 A typical crab picker can extract about 2-3 ounces of meat from each pound of whole blue crabs. Actual yields depend on the size and condition of crabs and experience of the crab picker. The traditional method for cooking crabs is steamed whole with a spicy crab seasoning. Another variation is to remove the top shell before steaming. In some areas, crabs are boiled with spices.